The present watch is, to the best of our knowledge, the only yellow gold reference 16618 to feature a lapis lazuli dial with diamond hour markers that has ever appeared on the auction market. Most reference 16618s with lapis lazuli dials feature luminous hour markers, making the present watch a singular example. It is interesting to note that the diamonds are set very similarly to the beloved SARU, reference 16758. The triangle diamond setting at 12 o'clock is notably very similar to that of the bejeweled GMT-Master. Rolex in particular excels at the incredibly time-consuming job of selecting, along with setting, well-matched hard stones and gemstones. Lapis lazuli is particularly prone to breaking, and to create this dial set with diamond hour markers was no easy feat. 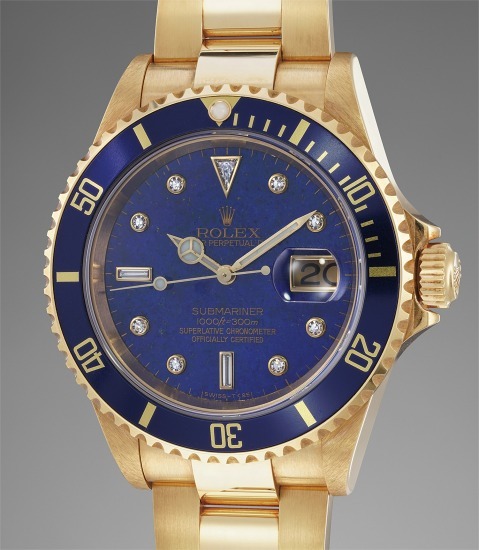 The watch itself is preserved in excellent and virtually new-old-stock condition. The factory sticker on the caseback is present, and even the blue sticker on the clasp of the bracelet has been preserved over time. Furthermore, the watch has seen no polishing throughout its lifetime, and the gold has developed an even layer of patina.